Are you planning an overseas trip, but got stuck with an incomplete visa application, because you don’t know how to get a No Objection Letter for Tourist Visa? Well, fret no more. We know that trying to apply for a visa can be quite a tedious process and there are a lot of things, like getting a no objection letter, travel insurance or dummy flight reservation, that you can get you all cluttered and confused. That’s why we’ve prepared this comprehensive article that has everything you need to know about the No Objection Letter for tourist visa and how you to get one for yourself. WHAT IS THE NO OBJECTION LETTER FOR TOURIST VISA? In simple terms, the No Objection Letter for Tourist Visa, which is also known as NOC or No Objection Certificate, is a letter from your employer or from your educational institution, stating that they do not have any objection against you travelling abroad during the approved leave period from the company. The No Objection Letter is a mandatory document in some countries, while a non-mandatory one in some others. Either way, you’ll only benefit from submitting an NOC along with your other relevant documents while applying for a tourist visa, as it adds to the trust factor needed to approve your visa. WHY IS A NO OBJECTION LETTER SO IMPORTANT? While it is true that planning a fun-filled tour to that country you’ve always listed top in your bucket list can be fun, there are certain hassles that may haunt you till the last moment. For example, the status of your tourist visa application. Most foreign embassies are extremely cautious about approving tourist visas, as they need to ensure, the visitors will return to their home country after the visit and won’t stay back to be a burden to their country. This is why, applying for a visa has turned out to be a horror story for many. Not to worry. Gaining the trust of the visa issuing officer at the embassy can be tough, but certainly not impossible. You just need all the documents that are necessary to show that you are financially healthy and won’t be a burden to their country. Sometimes, these documents alone would not guarantee the officer about your plans of returning to your home country. That’s why, you need to show, you have certain inevitable obligations and commitments in your native place, and since you can’t afford to leave those responsibilities behind, you need to return after the tour. The officially recognised way to prove that is through a No Objection Letter for Tourist Visa that you should get from your employer or from your educational institution. IS THE NOC FOR TOURIST VISA REQUIRED IN ALL COUNTRIES? While a No Obligation Letter is not required everywhere and the requirement varies from nation to nation, the nations that require a tourist visa for you for the travel demand a lot of document proofs before approving your visa. So, even though the No Objection Letter For Tourist Visa is not a mandatory document in all countries, it is definitely acceptable, along with the other important documents like your passport, ID proofs, photographs, and bank statements. Many visa applicants tend to miss out on the No Objection Letter for Tourist Visa even when it is a mandatory document for visas from certain countries, like the UK and the USA. So, before filling out your Visa Application and submitting it, remember to re-read the required documents section to know whether the No Objection Certificate is mentioned or not. To be sure, you can also contact the embassy and inquire whether it would be good to attach an NOC along with the requested documents. This way, you can further enhance your chances of getting your visa application approved just by being a trustworthy person before the immigration authorities! Also, carrying an NOC along with your Visa and relevant documents is really helpful while travelling too. Since you cannot predict anything that may happen during your travel, in case any authority has any suspicion against you, the distrust on your part can be negated with a No Objection Letter from your employer, as the investigating authorities will know that you’re on vacation and the company expects you back once the vacation is over. WHERE TO GET THE NO OBJECTION LETTER FROM? The No Objection Letter is provided by your employer or by your school/university if you’re pursuing studies. You can ask your employer/institution to provide an NOC with a sign and seal from your company or institution. Since most employers would be supportive of you going abroad, it wouldn’t be much of a deal to ask them for an NOC. On the other hand, in order to be sure of the content of the letter and how relevant it is for your tourist visa, you can draft your own No Objection Letter or use a suitable template from the internet. You can refer to our blog for samples for No Objection Letters. 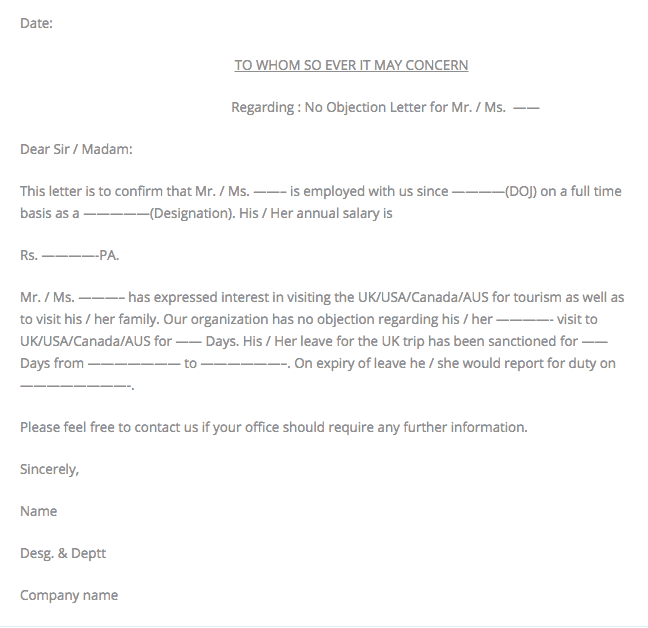 WHAT TO INCLUDE IN A NO OBJECTION LETTER FOR TOURIST VISA? When you write a No Objection Letter for Tourist Visa, the most important thing is to be specific, and pay attention to each and every little detail that you include in it. 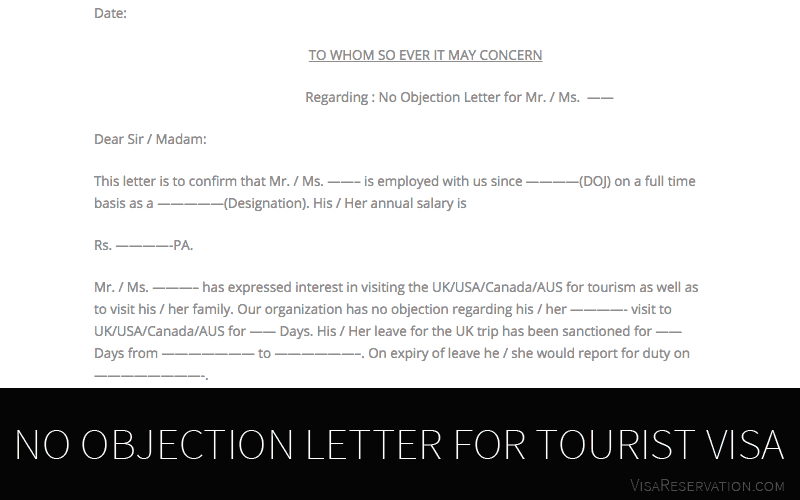 You can take a look as the sample No Objection Letter for Tourist Visabelow for reference. This letter should, of course, be written in a formal business letter format, as you see above. Remember to include your name, designation, annual salary, purpose of visit, and leave period in the content of the letter. Since the letter is from the employer to the immigration office, it should also have the full name and signature of your employer, official address, as well as the official seal of the company. Finally, if you need any more information about a No Objection Letter or anything else related to immigration, like flight reservation for visa or hotel reservations for visa, simply contact us to our consulting experts. We’re always happy to assist you in any way possible!